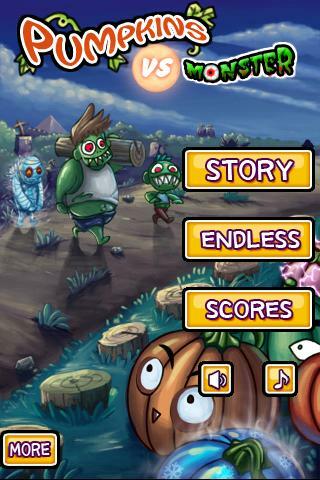 You are tasked with defending the bottom of the screen from monsters that inch slowly towards you ready to take over your precious pumpkin patch and quite possibly your brain too! 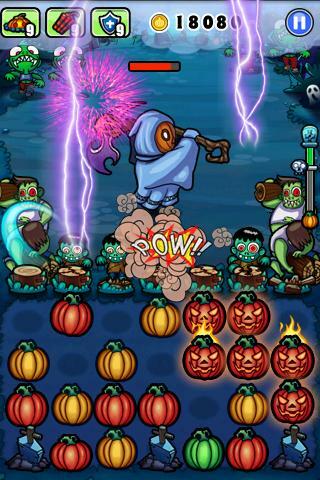 Thankfully you have the periodic sprouting pumpkins on your 7 by 4 grid patch to defend yourself against the onslaught. 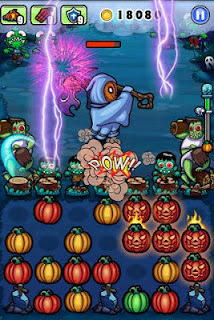 Pumpkins however need to be grouped into at least 3 of the same colour together with at least one of them on the front row in order to be hurled as your defensive weapon. The halloween fruits can be arranged by sliding them in either of four directions, space permitting, around the soil patch allowing you to build up your pumpkin groups accordingly.